Why Cut Back on Processed Meats? 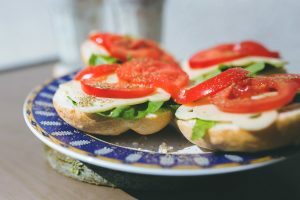 But we live in a sandwich society–so how to fill that bread or tortilla with something healthier than lunch meat? Read on my friends. To me, egg salad is pretty decadent. And eating it has actually helped me lose weight! We make hard cooked eggs 6 at a time. I take two to work, add mayo, home-grown tomato and some avocado and put it on top of baked corn tostadas. It would keep me full for hours and it was truly a balanced meal. 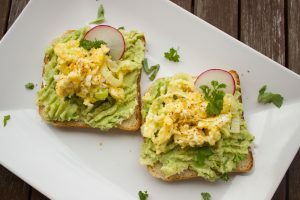 But if you’re not the mayo type, you could chop eggs into a veggie salad and roll it in a whole grain tortilla or pita. There is an extra bonus to using eggs (besides excellent protein). It’s rich in choline, a nutrient that’s important to brain health, both in pregnancy and as we age. 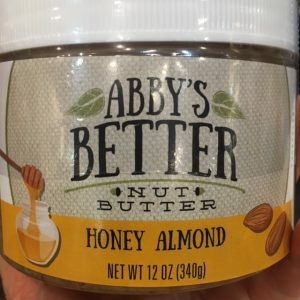 Last year I attended the Natural Products Expo East and was absolutely in heaven with the number of nut butters I got to taste. Not only are there many nut varieties, there are also different flavors! Cinnamon Peanut Butter, Maple Almond Butter, Pumpkin Spice Peanut Butter. I’m a big fan of nut butters, because they taste good and are oh so good for you. (Read more on why you should eat nuts even if you’re pregnant here and here.) To cut back on carbs, I often eat an open-faced sandwich covered in blueberries and a drizzle of honey. I also like nut butter on a whole grain waffle. Another tasty sandwich filling pairs nut butter with banana or other fruit rolled up in a whole grain wrap. Grilled chicken, pork tenderloin roast, pulled pork, thin sliced steak, fish filets. 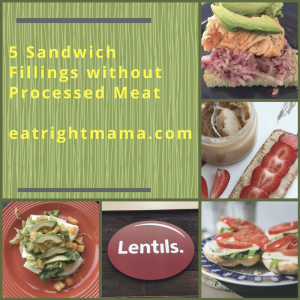 All these and more can be repurposed into a wonderful sandwich filling–without using processed meats. Here is where cooking once, and eating twice works well. See how I turned Steelhead Trout into a yummy sandwich here. Check out my post on meal prep here. Tuna and salmon now not only come in cans, they also come in pouches. And if that doesn’t make it easy enough, you can also get it in a kit with mayo, relish and crackers. 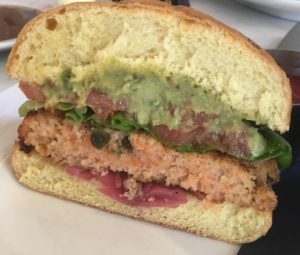 Tuna and salmon are perfect to keep in your pantry for lunchtime or any time you feel like there’s “nothing to eat.” (Choose light tuna as it contains less mercury than albacore.) Here on the border, folks go beyond just adding mayo and relish and add mixed veggies or corn to their tuna salad. Or try adding julienne carrots ion top of the lettuce to pump up the veggies. Hmmm. Beans on a sandwich may not sound that appealing, but stay with me. Gotta think beyond the bread here. Beans smashed with avocado, tomato and spices would go great on an open faced sandwich or in a wrap. Or, instead choose a bean burger patty and eat it on a bun. Add some greens and veggies like thin sliced cucumbers for crunch and you’re all set! 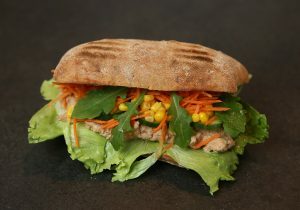 Or Simply make a veggie sandwich–all veggies or add some cheese for protein. Even when out it’s pretty easy to find a grilled veggie sandwich. Want more? Check Think Outside the Sandwich. What good ideas I found here. Sometimes I slap a slice of lunch meat & cheese on a piece of bread because it’s quick & easy. You’re making healthy eating more simple. Thank you. I’ll be passing up the deli case in the grocery store from now on.